How to use the time lapse? 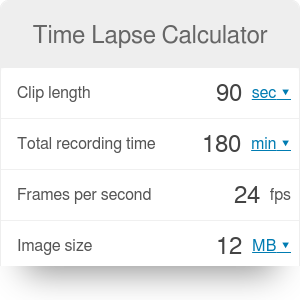 What can our timelapse calculator do? Whether you are a professional photographer or a beginner who just discovered his newest passion, this time lapse calculator will make preparing that magical night sky video a blast. You will be able to determine the capture interval, the number of photos you need, and the size of a memory card that will accommodate all of your precious pictures. Thanks to this tool, you will never have to spend hours calculating the parameters of your timelapse! The basic idea of time lapse photography is taking photos at a much slower rate that they are going to be viewed. The photos are combined to form a video that is much shorter than the total recording time. When the video is viewed, the time appears to be elapsing much faster than in reality. This kind of photography allows for capturing effects that are very subtle for a human eye, for example, the motion of stars and the sun in the sky. Our time lapse calculator can find seven basic parameters of a standard time lapse sequence. You have to predetermine four of them, and the time lapse calculator will automatically find the rest. Clip length: the duration of the final video created with time lapse photography. Usually, these clips don't exceed 30 seconds - if you want a longer video, it can be hard to take all of the photos in one shooting. Total recording time: the total time you need to spend taking pictures for your time lapse. This can range from 30 minutes for a short clip to a few hours for longer clips with a higher interval in between pictures. Frames per second: the number of frames in the final clip shown per second. Typically, 24 frames per second are used. Try not to go below 12 fps, as this will affect the image fluidity. High frame rates (up to 60 fps) correspond to high-quality videos, for example in 4K quality. Image size: the data size of one photo taken during the time lapse. You can read it off your camera's settings. If the total memory usage exceeds the capacity of your memory card, you can try to decrease the image size. Capture interval: the time interval between two consecutive photos. It usually doesn't exceed 30 seconds - a higher interval can cause the video to "jump" between frames. It can be calculated by dividing the total recording time by the number of photos. Number of photos: the total number of photos you need to take for your time lapse. It is simply the clip length multiplied by the frame rate. Memory usage: the total amount of space the photos will take on your memory card. It is found by multiplying the number of photos by an individual image size. For calculating the size of compressed videos, make sure to take a look at the video file size calculator. If you want to know how much time you will need to transfer these files from the memory card to the hard drive, check out our bandwidth calculator. Time Lapse Calculator can be embedded on your website to enrich the content you wrote and make it easier for your visitors to understand your message.